Purpose: To present a case of unilateral congenital microphthalmos with cyst. Method: Retrospective case report. Results: A 6-year-old female patient visited our outpatient department complaining of congenital progressive right orbital mass protruding lower eyelid. After her clinical examination and imaging modalities, grade 2 unilateral congenital microphthalmos with cyst diagnosis was made. In pediatric consultation no systemic association was detected. Excision of the cyst was performed under general anesthesia without any damage to micropthalmic globe. Acceptable cosmetic appearence acquired in early post operative period. Conclusion: In micropthalmic eyes with cysts ,other ocular abnormalities should be researched by clinical examination and imaging modalities before choosing treatment protocol. Pediatric consultation is also mandatory for systemic associations. Orbital cyst associated with microphthalmos occurs due to defective closure of embryonic fissure at 7-14 mm stage [1, 2]. Congenital microphthalmos is a rare condition with prevalence rates of 1.4–3.5 per 10 000 births. Differential diagnosis with encephalocele, dermoid cyst, congenital cystic eye and tumors should be done carefully [4-7]. Although unilaterality is the characteristic fashion, it can be seen bilaterally [2, 8, 9]. Figure 1. Appearance in primary position. 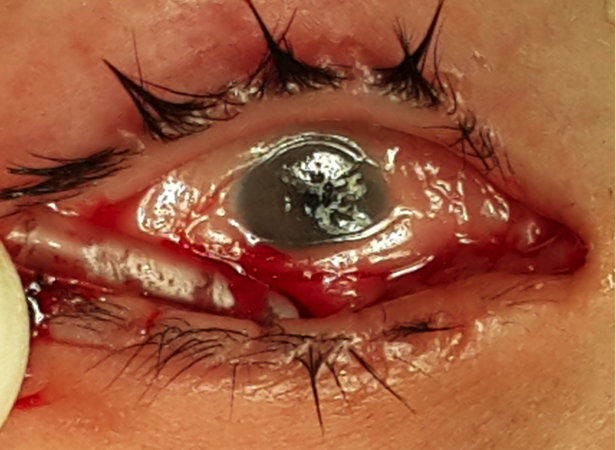 Six year old patient admitted with congenital orbital mass on the right side. In her clinical examination, superiorly deviated micropthalmic eye with inferiorly located soft cystic mass protruding the lower lid was detected (Figure 1). Micropthalmic globe was digitally hypoton and no perception of the light was present. Anterior segment components could not be seen in detail in biomicroscopic evaluation. In orbita-cranial magnetic resonance image (MRI) cystic mass was found to have apart borders than micropthalmic globe. Under general anesthesia, the cystic mass dissected from micropthalmic globe and excised with no damage to globe (Figure 2,3). Histopathologic diagnosis was made as; cystic mass with neuroglial and striated muscle tissue. An accaptable cosmetic appearance was achieved in early post operative period (Figure 4). Congenital microphthalmos with cyst was defined in three categories; a relatively normal eye with a small cyst, not apparent clinically; an obvious cyst associated with a grossly deformed eye; a large cyst which has pushed the globe backwards so that it is not visible clinically . Presentation symptoms are generally congenital mass and increasing lower lid protrusion [1, 2]. Congenital micropthalmos with cyst can be isolated or associated with other ocular or systemic abnormalities. Congenital heart defects, central nervous system diseases, cleft lip/palate, pulmoner aplasia and renal agenesis was reported in these patients [1, 2, 6, 11-13]. Although systemic abnormalities associated with microphthalmos were probably no more common in cases with bilateral cysts compared to cases with unilateral cysts in some reports , in different reports famial and bilateral cases are associated with systemic abnormalities more common . Patients with orbital cyst with micropthalmos or anopthalmos should be referred to a pediatrician for associated systemic abnormalities or syndromes defined by Warburg [3, 14]. Although congenital micropthalmos with cyst is a clinical diagnosis, imaging modalites are necessary in large cysts pushing globe and help for diagnosis if ocular remnants are present . Coloboma, cyst and micropthlamic eye can be imaged by orbital ultrasonography [15-17]. Also MRI and orbital tomography helps for imaging cyst, micropthalmic globe and their communicaion if present . Treatment is not standard for every case and principally depends on visual potential, cyst size and orbital volume .Simple small cysts with normal ranged orbital volume should be observed while others treated surgically . Aspiration of the cyst is the easiest way of surgical treatment but recurrence rates are higher, although some authors report cure . 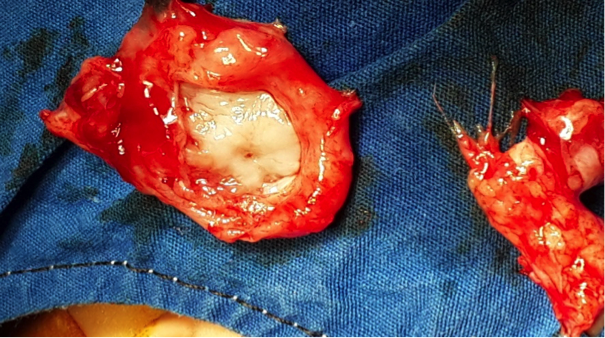 Excision of the cyst or enucleation are other surgical choices. Surgery is usually recommended before school age for cosmetic appearance, since 90% orbital bone maturation was already completed until school age [3, 22]. Figure 4. Appearance at post operative first day. In our case, the cyst was grade 2 according to Elder classification and a micropthalmic globe with normal orbital volume but no visual potential was present. MRI was consistent with cyst. After pediatric consultation excision of the csyt was performed and acceptable cosmetic appearence achieved in our case. In micropthalmic eyes with cysts ,other ocular abnormalities should be researched by clinical examination and imaging modalities before choosing treatment protocol. Pediatric consultation is also mandatory for systemic associations. Dr. Ahmet ŞENGÜN, Ankara Numune Training and Research Hospital, and Dr. Dilek GÜVEN, Sisli Hamidiye Etfal Teaching and Research Hospital, recommend publication of this article. S, D.-E., Normal and Abnormal Development: Congenital Deformities. in System of Ophthalmology. (1963): London. Pp451-453.